Plot Summary: The time is 972 A.D. in Kyoto, the capital of ancient Japan. Kyoto is becoming a corrupt and run-down city; selfish samurai and onmyoji, who care only about gaining political power are everywhere. To make matters worse the city is suffering from famine and widespread disease. 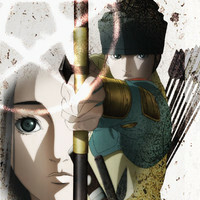 Unable to ignore the condition of the city any longer, the Imperial Court decides to send Minamoto no Raiko, a famous samurai well-known for his archery skills, to recover a legendary gem said to hold mysterious power to save the world. However Raiko also falls ill to disease. Instead his youngest sister, Hikaru, decides secretely to make the journey in his place. Hikaru meets many people, and has many adventures while on her trip for the legendary gem. Otogizoushi has two arcs of 13 episodes each. The first 13 episodes, the Heian arc is set in the Heian period of Japan, while the next 13 episodes, the Tokyo arc is set in modern-day Tokyo with reincarnations of the characters from the first 13 episodes. The last two episodes are TV specials, not regular episodes.